Are you trying to find the right luxury wagon to purchase for your family and to use as you go around town? 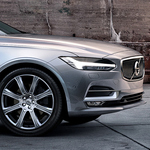 Bobby Rahal Volvo Cars would love to show you how the Volvo V90 can work for you and the way that this popular vehicle can perform on the road. When a vehicle is set up with good ground clearance, that can affect the way that the vehicle drives and all that you can do with that vehicle. The Volvo V90 is set well off the ground to help you drive well on all kinds of surfaces. Are you someone who is particular about the way that your vehicle steers and who would like to be able to customize something like that? The Volvo V90 allows you to choose a steering setting. This specially designed vehicle also adjusts the way that it steers based on the speed at which you are traveling.